This biography is a compilation of information that I have collected over time from numerous resources, a few of which are listed at the end of this article. Richthofen, Manfred Albrecht, Rittmeister Freiherr von (1892-1918) born Breslau, Germany (now Wroclaw, Poland). The Richthofens, a wealthy Junker family, had always lived in the country, and most of them had landed estates. Manfred and all the ancestors before him had estates about Breslau and Striegau. His mother belonged to the family Von Schickfuss und Neudorf. The revolt of 1848 one of the finest castles of a Schickfuss was burnt down. Also in the ancestry is the name of Falckenhausen. Manfred was born on May 2, 1892. He was named after his Uncle Manfred, who in peace time, was adjutant to His Majesty and Commander of the Corps of the Guards. As a youth he enjoyed hunting and riding. 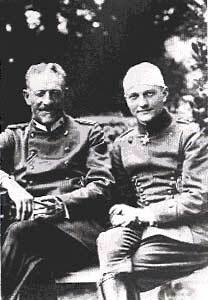 At his father's request, Richthofen entered the Prussian military academy at the age of eleven and joined a cavalry regiment upon his graduation in 1912. As a cavalry officer, he saw duty on both the Eastern and Western fronts scouting for the German Army. When war broke out, Richthofen was stationed near the Russian border and was engaged in one of the first skirmishes of the war. By the end of May 1915, after a few months in the trenches of the Western Front, he applied for a transfer to the Air Service. After flying for a few months as an observer with a bombing squadron, he trained as a pilot, passing his final exams on Christmas Day 1915. He was assigned to a two-seater squadron in Russia, when Oswald Boelcke, Germany's top ace, asked him to join a new single-seat fighter squadron. Richthofen arrived at his new airfield on September 1 and scored his first victory less than three weeks later. Richthofen's career progressed rapidly. In mid-January 1917, he was given command of his own squadron (Jasta 11) and was awarded the Pour le Merite, Germany's highest award for bravery. On July 1, he took command of a new formation, Jagdgeschwader 1, which was composed of four Jastas (4, 6, 10, and 11) for an effective strength of 48 aircraft. This large formation did not fly regularly scheduled patrols, but went up only when the enemy was sighted. Front-line observers rang Richthofen's headquarters to report enemy strength, and the necessary number of fighters scrambled to intercept. As Richthofen phrased it, "We can just wait for the customers to come to the shop." The unit lived in tents so they could move from base to base overnight. They would take to the air in massive V formations with the Red Baron at the point. On his first mission as leader, he scored his seventeenth confirmed victory, the squadron's first. The Baron's fighting policy was the same as his mentor, Boelcke: Always begin the encounter with an advantage, don't show off, and shoot down the target as quickly as possible. Here is Richthofen's account of his twentieth victory, a typical one: "While flying back from a conference with the Boelcke squadron, I saw an enemy artillery flyer at a height of 6,000 feet, west of Loos. I approached within 50 yards of him without his noticing me and attacked immediately. After several hundred shots, the plane dashed down, falling into our trenches." Richthofen was not a naturally superb pilot. He crashed on his first solo, and his own writings contain numerous references to other self-induced mishaps. 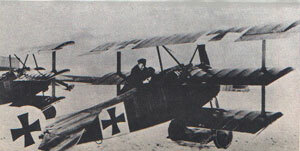 Once, after forcing a Vickers two-seater to crash-land in flames, his own Albatros began sputtering and he too had to land. "The result was very comical," he wrote. "My enemy with his burning machine landed smoothly, while I, his conqueror, came down next to him in the barbed wire of our trenches and my machine overturned." Luckily for Germany, Richthofen was not always so clumsy. By the end of "Bloody April," he had 52 kills and was called home to meet the Kaiser. Blond and handsome, he became his nation's idol. Women asked for his autograph and noblemen jostled one another to be next to him at state functions. While Richthofen met with royalty and relaxed on the home front, things were going poorly for his colleagues in the trenches. German leadership increasingly turned to pilots to supply the advantage, and Richthofen returned to battle in late June 1917, with a new command and a new strategy. As Commander of the Eleventh Chasing Squadron, it occurred to him to have his Fokker plane painted all over in a striking red. The result was that everyone soon came to know his plane. In the air he embodied deadly grace and his experience as a hunter helped him as a pilot. French fliers spoke of "le Diable Rouge," the Red Devil. Others called him the Red Knight, or the Red Baron. Wild rumors sprang up about the red fighter; some even claimed that the plane was piloted by a woman. Morale soared in his unit, and before long Jasta 11 ruled the skies in their sector. Soon his men painted their planes red, although all but the Baron were required to display at least one other color. A national champion horseman before the war, Richthofen had grown fond of trophies and ribbons. During the war, he went so far as to award himself an engraved silver cup for each Allied plane he downed. Although Richthofen was the deadliest pilot of the war, he was not particularly bloodthirsty. He occasionally passed up the chance to finish off an enemy as long as he was sure that the airplane was going to crash. Consequently, many pilots and observers who are among his "kills" actually lived to tell about it. Here are three such accounts: F.J. Kirkham, observer-gunner, British B.E.2c, April 28, 1917: "I was watching the ground for the arrivals of our shells when a burst of machine fire came to my attention directly behind me. I turned quickly and stood up to man the rear gun. I was too late. The red Albatros had continued its dive downward just in back of our tail and was way out of range. He must have been doing 150 miles an hour. He was away in the flash of an eye." 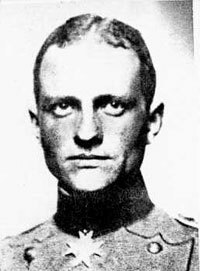 On July 6, 1917, Richthofen was severely wounded when a glancing shot creased his skull. He remained in the hospital for three weeks, returned briefly to duty, then went on convalescent leave until the end of October. During this time, he was active in lobbying for aircraft improvements and promoting an open competition among manufacturers for a new fighter plane. The competition took place in January 1918, and resulted in production of the Fokker D-VII, considered to be one of the best aircraft of the war. In his aim to be better than the manufacturer of the Albatros, Anthony Fokker built a brand new type of airplane: The "Fokker Dr1 Dreidecker". The presentation of this plane was in Berlin. Manfred von Richthofen tested the Dr1 and said "It climbed like a monkey and maneuvered like the devil." He was instantly sold on the airplane and his Jagdgeschwader was the first to receive the new triplanes in early September of 1917, replacing JG1's Albatros D.IIIs and D.Vs. Richthofen was a quieter, sterner man now, a taskmaster with his flyers. "He who passes his judgment, he backs all the way," wrote one of his students, the ace Ernst Udet. "Whoever fails, he drops without batting an eyelash." He was given a hero's welcome where ever he went and he started to realize that the people did love him. He began to get more depressed and the emotional weight of being responsible for so many deaths began to press on him. He was asked to retire, or step down from his position, but refused to stop flying. In the air, Richthofen and JG1 flew mission after mission in support of the ground troops. On April 20, 1918, the Baron scored victories 79 and 80. "That is really a decent number," he said at the end of the flight, unaware that there would be no more. With Richthofen H.J. Sparks, gunner, Bristol Fighter, March 12, 1918: "No sooner had the action signal been given than we were pounced on from above by various types of Hun machines numbering about 20. I could tell from the red undercarriages that they were members of Richthofen's Circus…. I was just getting into position to try my luck with the all-red machine which I presume was Richthofen's, but the Baron got me before I got him. His first stream of lead went through my left shoulder and arm, rendering me entirely useless. The shock knocked me down into the cockpit." Sparks was captured and the Germans hospitalized him. "During my second day in the hospital, a German flying officer came in and said he had been sent to see me by Baron von Richthofen, who wished me to accept half a dozen cigars with his compliments. I did, with thanks." D.E. Lewis, pilot, Sopwith Camel, April 20, 1918: " I was attacking a bright-blue machine, which was on a level with me, and was just about to finish my adversary off when I heard the rat-tat-tat of machine guns coming from behind me and saw the splintering of struts just above my head. I left my man and wheeled quickly to find that I was face to face with the renowned Richthofen….I twisted and turned in the endeavor to avoid his line of fire, but he was too experienced a fighter, and only once did I manage to have him at a disadvantage…and thought I would have the honor of bringing him down, but in a trice the positions were reversed and he set my emergency petrol tank alight, and I was hurtling earthward in flames." Richthofen's official accounts of his victories were dictated by military tradition. March 25, 1917: "An enemy squadron had passed our lines. I went up and overtook their last machine. After only a few shots, the enemy's propeller stopped running. The adversary landed near Tilley, thereby upsetting his plane. I observed that, some moments later, it began to burn." April 2, 1917: "Together with Lieutenants Voss and Lothar von Richthofen, I attacked an enemy squadron of eight Sopwiths above a closed cover of clouds on the enemy's side of the lines. "The plane I had singled out was driven away from its formation and tried to escape me by hiding in the clouds after I had put holes in its gasoline tanks. Below the clouds, I immediately attacked him again, thereby forcing him to land 300 yards east of Givenchy. But as yet my adversary would not surrender, and even as his machine was on the ground, he kept shooting at me, thereby hitting my machine very severely when I was only five yards off the ground. Consequently, I attacked him already on the ground and killed one of the occupants." 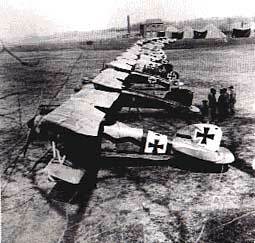 March 25, 1918:"With five planes of Staffel II, I attacked several English one-seaters northeast of Albert. "I approached to within 50 yards of one of the machines and shot it to flames. "The burning machine fell between Contalmaison and Albert and burned on the ground. Bombs that had apparently been in the plane exploded several minutes later." On April 21, 1918, above a German position at the Somme, a group of Fokker Triplanes jumped a pair of lumbering R.E.8 observation planes of the No. 3 Australian Squadron. Allied antiaircraft gunners tried to help the scouts with a quick barrage. The puffs of white smoke drew the attention of Capt. Roy Brown, who led a flight of eight Sopwith Camels far above the mismatch. Wagging his wings for his fellows to follow, Brown dived into the fray. Soon some Albatros Scouts joined in, as did a new group of Fokkers. Among them was an all-red triplane. A young Canadian, Wilford May, was flying his first combat patrol. Capt. Roy Brown had told him to stay above any fight, should one develop. May did, but after a couple of Albatros D.Vs swooped by him, he couldn't resist the temptation to join the battle. He quickly became overwhelmed in the tangle of 30 or more planes, and broke away, flying a dangerously straight line away from the fight. Richthofen, flying above the scrap, noticed this sign of weakness and gave chase. May began evasive maneuvers after the Baron's initial burst. He and his German pursuer screamed along just above the ground, the Triplane steadily gaining. Brown was still involved in the dogfight above when Brown noticed May's plight. Brown knew that unless he distracted the Triplane pilot, his boyhood friend May was doomed. Diving at full speed, he swept in behind the Fokker and fired a distant, desperate burst before May and the German disappeared behind a stand of trees. It took Brown a few seconds to find the two airplanes again, but when he did he closed on them quickly, since they were zigzagging wildly. All of a sudden the Triplane swerved away from the chase and descended, snapping off its landing gear as it touched down. May escaped; Brown turned back to the main dogfight. Australian ground troops had also fired at the Fokker as it came by, and they saw it crash-land in no-man's land. When its pilot did not move, several of the Australians rushed out, and dragged the plane to a safe place. At first they could not see why the Triplane had come down. It was unscathed except for the damaged gear. Then one of them noticed a bloodstain on the pilot's jacket, and saw that one bullet had pierced his heart. Examining the dead man's papers, the soldiers were awed to see that he was Manfred von Richthofen. Historians still argue over who fired the single bullet that killed the Red Baron. The Australian gunners tried to claim the kill, but credit is generally given to Brown. Richthofen was buried the next day in the small village of Bertangles. British and Australian troops gave him full military honors, and a British pilot dropped a note in German territory containing the news. Germany went into deep mourning. Richthofen was eulogized throughout the flying world, including this tribute in a British flying journal: "All airmen will be pleased to hear that he has been put out of action, but there will be no one amongst them who will not regret the death of such a courageous nobleman…. Anybody would have been proud to have killed Richthofen in action, but every member of the Royal Flying Corps would also have been proud to shake his hand had he fallen into captivity." 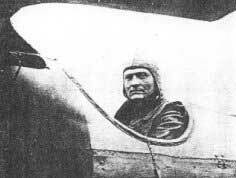 In 1925, Manfred von Richthofen's younger brother Bolko recovered his body and took it from Bertangles to Berlin. Manfred had the largest funeral ever seen in that city. His final resting site is Wiesbaden. von Richthofen, Manfred, "Der Rote Kampfflieger", 1917. Bodenschatz, Karl, "Jagd in Flanderns Himmel", Munich: Knorr & Hirth, 1935. Kilduff, Peter, "The Red Baron", New York: Doubleday, 1969. Morrow, John H., Jr., "German Air Power in World War I", Lincoln: University of Nebraska Press, 1982. Manfred Freiherr von Richthofen's medical record - was the "Red Baron" fit to fly?